Diabetes mellitus is caused due to a decrease in the hormone insulin produced by the pancreas gland. A decrease in insulin hormone resulting sugar is consumed the body can not be perfectly processed, so that blood sugar levels to rise. Normal blood sugar levels are <110 mg/dl during fasting or <140 mg/dl 2 hours after eating. Said to suffer from disease when blood sugar levels> 126 mg/dl during fasting or> 200 mg/dl 2 hours after eating. 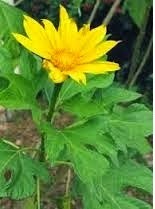 Leaves insulin has the scientific name Tithonia diversifolia. This plant comes from Mexico. This plant is rarely cultivated deliberately but only used as a hedge plant. These plants also grow wild in the river or courtyard. Plant known as Mexican Sunflower has characteristics such as finger leaves, woody stems with a height of 1 meter and has yellow flowers resemble sunflowers. Leaves insulin is still less known by the public. This plant popularly known as mexican sunflower and used as anti-diabetic and anti virus by Taiwan society. The country Kenya this plant used to treat digestive disorders. While in Nigeria, the plant leaf is regular insulin used by the public for malaria drugs, liver, and strep throat. Research on plant leaves this insulin is not yet widely done in Indonesia. Several studies done abroad as is done by Toshihiro Miura and colleagues from the Department of Clinical Nutrition, Suzuka University of Medical Science, Japan in 2005. The research was done by giving the ethanol extract of leaves of Tithonia in rats with Diabetes Mellitus, which has a weight 20-25 grams. Concentration of the solution used is 100 mg/kg, 500 mg/kg, and 1,500 mg/kg body weight. As a control used mice that were given distilled water 20 ml/kg. Blood sugar levels in mice was measured every week. The results showed that blood sugar levels mice fed the ethanol extract of Tithonia decreased blood sugar levels significantly. The higher concentration of ethanol extract higher the blood sugar levels drop. At a concentration of ethanol extract 1,500 mg/kg was able to lower blood sugar levels of mice were originally 509 ± 22 mg/dl to 340 ± 14 mg/dl to 7 hours post-treatment. While the control mice kept their blood sugar levels. 4. Drink warm or cold current. Pulp leftover stew can be boiled again until translucent colors. Leaves Insulin for healing herbs can consume 3x daily (every drink 1 cup). If the blood sugar has dropped frequency of consumption of herbs can be reduced to 2 times a day, and 1 times a day. Regularly check blood sugar levels is very important to control blood sugar. Treatment of diabetes mellitus with Leaves insulin herbs should also be accompanied by a diet of sugar.